March 2012 was the third warmest on record. Summer 2012 was the second wettest on record. Spring 2013 was the coldest in 50 years. May & June 2013 the wettest on record.July 2013 the hottest this century. Ed is a member of the Earth System Science group at Exeter University. He will report on current scientific understanding of what is influencing our weather and how it connects to climate change. Dave is a fireman and is the National Officer for Floods for the Fire Brigades Union. He will talk about fighting floods, the potential dangers, and the proposed cut-backs to the Fire Service. Chris Williamson is the Shadow Fire Minister. He will talk about the need for Government to tackle Climate Change, and how to respond to impact of erratic weather. We’re used to unpredictable weather and all sorts of daily variations – that’s why we talk so much about the weather in Britain! But the extreme weather of recent years is new. We in Derby, cocooned by our central heating and air conditioning, may find it difficult to attribute the exceptional and unpredictable weather changes to climate change. We soon forget the freezing weather we had this spring, or the rather warm autumn two years ago, and the floods. However recent years have seen the deadliest ever tornados in the tornado belt in the USA, unprecedented flooding in Australia and Pakistan, heat waves and fires in Australia and other parts of the world. And the list goes on. We brush off the fact that scientists have warned for a long time that global warming would be accompanied by a break down of normal weather and we would see more extreme fluctuations and unpredictability. The Met Office held a meeting of experts in June to find out what the reasons are for this new feature. Everyone agreed that the movements of the ‘jet stream’ have changed but what is their cause? Photo shows floods near Barrow upon Trent, Derbyshire, Nov 2012. 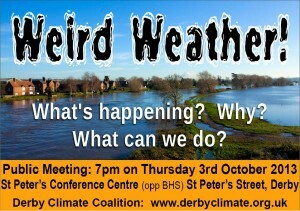 Fracking has been in the news and a couple of us in Derby organised a public discussion, at very short notice. We invited people to come in to share ideas, and not to have a dogmatic view about fracking. The idea was not to have a ‘expert’ from outside but use our collective expertise. Despite it being the summer and very short notice, 15 people attended and the discussion was very good, and well informed. A couple of people cam from Nottingham and some people came who we hadn’t seen for some time. We started with the interview with Caroline Lucas from the today programme on Tuesday. 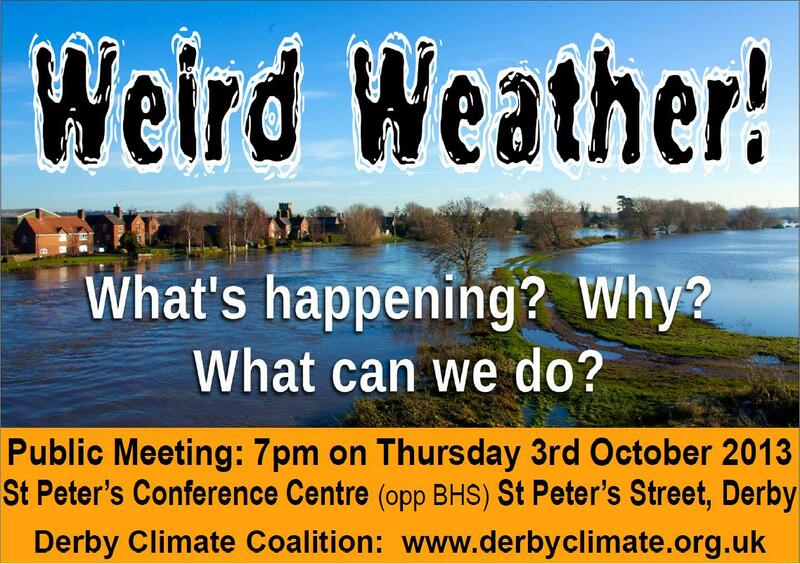 http://derbyclimate.org.uk/wp-content/uploads/2013/08/Caroline-Lucas-Today-Programme-20-08-2013.mp3 . We also copied the article from Monbiot 21/8/2013, and some exchanges from the Climate Alliance site on the subject. This led us resolving to take the issue up with the Council, and also inside the planned meeting of the Derby Peoples Assembly.